25 years of demonization of the Supreme Court, frustration with the pace of anti-abortion progress, and a call to take the steps of the Court may lead to an unprecedented demonstration there following the annual March for Life. In our travels over the last few months, it's been difficult to avoid noticing the central role the Supreme Court plays in Biblical America. It serves as a lightning rod, as scapegoat, as a stone and mortar symbol of their worst fears of what America has become. There are some who literally demonize the Court, producing graphics with a huge red demon in the sky behind the building. Others, such as Randall Terry in his campaign video, are a bit less graphic, framing the Supreme Court's actions as a "betrayal of our Christian roots" and in violation of Scripture. 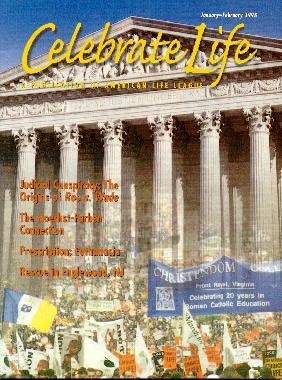 The primary reason, of course, for the demonization of the Supreme Court is the 1973 Roe vs. Wade decision. However, what's not immediately apparent from the outside is to what degree the Court is a symbol of much more than just one unfavorable decision to the Biblical America movement. To them, the Court demonstrates an unacceptable rejection of "God's Word" as the standard for government, across the board. We obtained this brochure at the Promise Keeper rally in Washington DC this past October. In it, another source of disapproval of the Court is cited: How tragic and how wrong was the Supreme Court in banning from public schools, along with prayer and Bible reading, the very thing that our Founding Fathers said was key to our survival - God's moral law - the Ten Commandments. This brochure was not produced by a fringe group, but was produced as a promotional item by the Washington area's most powerful Christian radio station, WAVA. The concept of any separation between church and state, or even that there is any difference between the church and the state, is completely absent. It's also easy to see that there is a rising level of frustration in the 'pro-life' movement. Legislation banning the so-called 'partial-birth abortion' procedure has again been vetoed. While there is a slow erosion of abortion availability, and legislation imposing various restrictions has passed in numerous states, the goal of "not even a little bit of abortion" remains elusive. For these reasons we think the crowd that will arrive in Washington on January 22 will not be docile, and that there is a considerably higher chance of conflict, in contrast with past years, with people or with authorities that they perceive as enemies of their cause. It's important to understand the way Biblical America and compulsory pregnancy advocates (CPA's) view the law to fully understand their reaction to the decisions of the Supreme Court. To their worldview, their interpretation of the Bible and God is supreme; all aspects of life must be governed by these views, extending not merely to their own lives but throughout society. Thus they think that all mankind's laws, particularly here in America which they view as having been founded as a Christian nation, should be based upon their particular interpretation of Biblical law. Consequently, those laws which fall outside of their Biblical worldview are seen as invalid and may be violated at will. There is perhaps nothing more dangerous than a person who believes he holds the one true way, or the truth. Biblical America has set itself up as a moral arbiter, and translator of the truth to the unbelieving. When naming their groups, they choose names such as "Operation Rescue" whose focus was, ultimately, the rescue of the culture and of America herself. Here we find the notion of the participants in Biblical America being better informed or educated than the general populace; it becomes their duty as holders of the truth to then correct societal behavior to their 'standard.' (From this reasoning comes the Operation Rescue t-shirt slogan, "Jesus is the Standard.") As with any totalistic ideology, the presumption is that all who aren't in agreement with the believer have simply not been educated, that they are ignorant of the "truth." In practice, this presumption is sometimes expressed as a harassing or stalking behavior, as we often see in front of abortion clinics today. 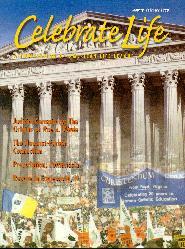 Cover of January-February 1998 issue of Celebrate Life, an American Life League publication. We expect that on January 22, we will watch as a large number of demonstrators - perhaps thousands - take to the steps of the Supreme Court in open defiance. Both that act, and whatever statements that are made from the steps, will be intended as a warning, that peaceful compromise with our government as it now stands is impossible. On the steps we expect to find Bernard Nathanson, onetime co-founder of NARAL, who claims he lied about the numbers of illegal abortions to create a moral imparative to enact legalization, Norma McCorvey, the Roe of Roe v. Wade, and Sandra Cano, Doe of Doe v. Bolton. All three of them will renounce their role in the legislative and judicial history of making abortion legal. Our interview with Nathanson made it clear that his own ethical contortions may be a possible explanation for any lying he may or may not have done. We feel even one woman's death is one too many; numbers were never the issue. Additionally, we question whether Nathanson's participation within the abortion rights movement was perhaps to his own edification. Either way, he, and the NARAL he helped create were built far less upon the true desires and needs of women, and far more upon the "medically necessary" or even the "for their own good" school of abortion rights. McCorvey was barely a party to the decision that bears the Roe name - the fault of her lawyers, who failed to even keep her informed of the details of the case. McCorvey's lawyers also failed to even so much as help her obtain an illegal abortion, thus McCorvey, for all her role or lack of role in the American abortion saga has never had an abortion. All she did was get talked into signing a piece of paper. For that reason alone, she was hounded and harassed for years by the anti-abortion movement. We prefer to avoid questioning McCorvey's conversion or her decision to join the 'pro-life' cause. What is open to criticism is the CPA's open use of her as a trophy and her new "Roe No More Ministries." We believe her new group may be viewed as we view much of the rest of the CPA movement, as yet another method of using coercive means to erode away women's dignity and freedom. We will have to watch closely to see if she follows in the footsteps of her mentor, Flip Benham, or if she chooses a different route. Sandra Cano, by her own admission, has always considered herself 'pro-life.' She has had no conversion experience here, she is instead angry about the allegedly inappropriate use of her name in the Doe case. Another event adding more fuel to the already heated circumstances this January 22 is the recent arrest and incarceration of Joan Andrews Bell, a longtime CPA activist who has finally been brought to justice for a crime committed many years ago. Joan epitomizes a class of career 'pro-life' activists that we call 'nomads for life,' who are often marginally employed, seek arrest again and again, and try to avoid the consequences, as they often skip town long before hearings or sentencing and refuse to pay fines. Andrews has distinguished herself for not cooperating with authorities, serving lengthy jail time, and for painting hereself as "continuing" the tradition of civil disobedience and the "non-violent leftist" edge of the movement. She is a cause many are comfortable supporting. We see her differently, as a long time activist on the run who has hidden and refused to face the consequences of her actions. She has traveled as far away as Toronto to avoid being arrested in the United States in violation of a judge's order. She is to our view, more of a junkie in need of a fix; desperate to be on clinic property, she's a woman more in need of serious help than the saint she is sometimes described to be. "Saint Joan," as some refer to her, has just been sentenced and we expect the aftereffects of her continuing martyrdom to play out in the demonstration at the Supreme Court. Under a lawful, secular government, Joan Andrews Bell and her ilk will not and should not be accomodated; inevitably, Biblical America will respond by claiming persecution and making thinly-veiled threats of insurrection. We expect to see this conflict play out, perhaps on an unprecedented scale, in front of the Supreme Court on January 22. Judie Brown of the American Life League acknowledges the lack of progress of the 'pro-life' movement by asking, What went wrong in 1997? The Operation Rescue action is scheduled to continue through Sunday January 25, according to their January 1998 newsletter. Links to Joan Andrews Bell web pages, on various CPA websites. Reader beware. Americans United for Separation of Church and State frequently reports on church-state issues.